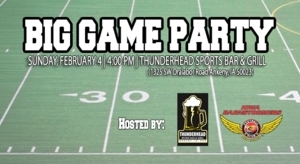 DES MOINES – The Iowa Barnstormers are pleased to announce the return of our Big Game Watch Party! The Barnstormers have teamed up with Legends American Grill to host the ultimate football viewing party. Join the Iowa Barnstormers on Sunday, February 1st at Legends in downtown Des Moines to watch the New England Patriots take on the Seattle Seahawks. Members of the Barnstormers team, coaching staff, front office, and Storm Chasers dance team will be in attendance. The Big Game Watch Party will kick off at 4:30 p.m. Fans interested in reserving a table for the party should call Legends at (515)-243-0700. Legend’s Sunday specials include a free snack bar, $2.00 Coors Light tall boys, and $3.00 bomb shots at halftime. It’s going to be a SUPER time. Season tickets are on sale for the Iowa Barnstormers 2015 season starting as low as $77 per seat. Season tickets are the perfect gift for the football fan in your family. Don’t miss a minute of the action this season! For more information, call the Barnstormers at (515) 633-2255 or log onto www.theiowabarnstormers.com.